In large pot, brown 1 pound of ground meat. Drain and season with 1 packet of taco seasoning. Bring to a boil. Reduce heat and simmer for 15ish minutes, until liquid is absorbed, adding more chicken stock if needed. Once pasta has reached desired consistency, stir in 4 ounces Mexican blend cheese. Serve with sour cream, salsa, crushed tortilla chips, or other favorite taco toppings. Easy, easy, easy. I opted for ground pork because it was on sale this week but brown up whatever protein you like best. Plus, you might try experimenting with various types of taco or enchilada seasoning! 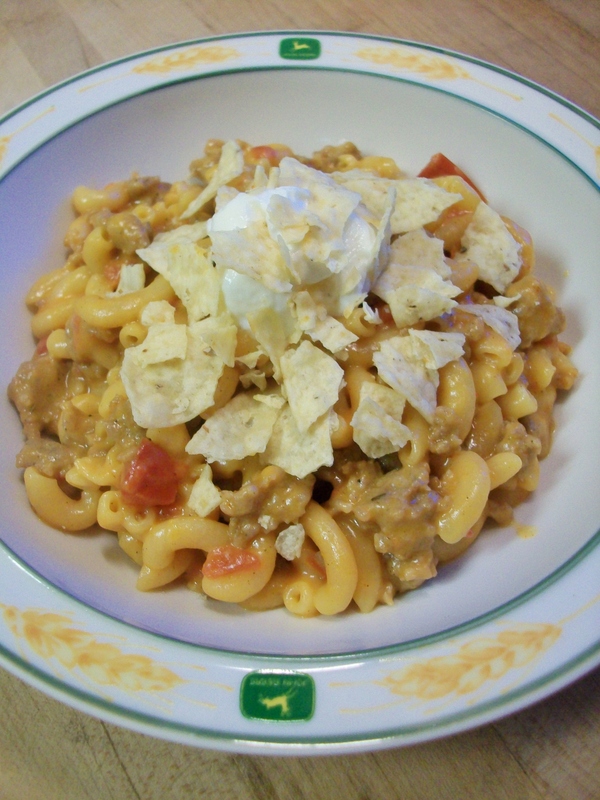 Posted in PastaTagged cheese, Easy, inexpensive, Mexican, onepot, recipe, tacoBookmark the permalink.